These are some of the most stable carbocations, but what is the relative stability order between them. According to me it should be: C>D>B>A........ I came to this conclusion because both C and D have equal number of resonating structures i.e.7.However Bend orbital Bond seems to stabalise more than Resonance so C is assigned higher priority. However, my teacher says that the order should be C>B>A>D........ and he gives priority to Bend orbital bond above anything else. However, I seem to disagree with his answer. Unfortunately, I don't have the source of the question to verify the answer and couldn't find anything relatable on the internet. The remaining three carbocations are just stabilized by hyperconjugation, which rises with the number of alkylsubstituents bonded to the central carbon. Not the answer you're looking for? Browse other questions tagged organic-chemistry stability resonance carbocation bent-bond or ask your own question. Can a organic compounds such as hydrocarbons contain an ionic bond? 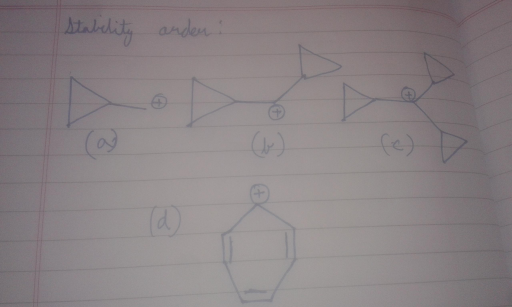 Which factor should I take into priority to determine reactivity of of Halides? What is the major product formed on addition of Hydrogen Iodide to Pent-2-ene?